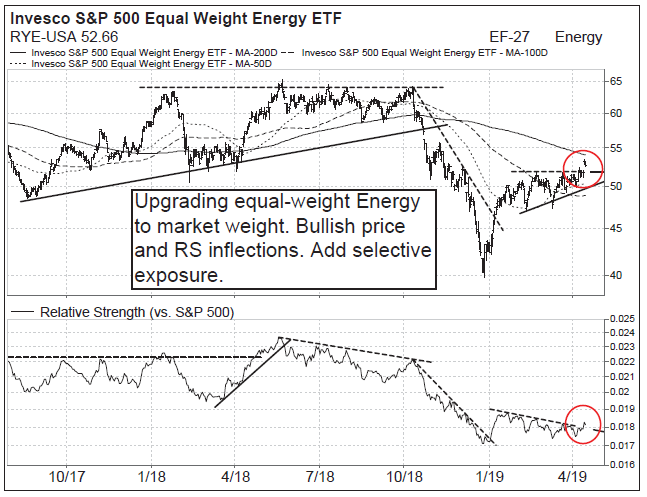 Of the ten items highlighted in last week’s Compass that we would like to see in order to turn more bullish, two have happened — equal-weighted Energy and UK/European Financials are breaking out. This only serves to add to our already positive outlook as U.S. equities are poised to test all-time highs. We are upgrading equal-weight Energy to market weight. Also in today’s report, we highlight attractive Groups and stocks within Technology: Large-, Mid-, and Small-Cap Semiconductors. The March data released today by China’s National Bureau of Statistics (NBS) shows the market for new home sales continues slowing down very gradually in terms of volumes. More significantly, the past 2 months saw declines in land sales (land acquisitions by developers) on a year-to-date and 3-month year-on-year basis, which could potentially indicate a sharp change of the trend from 2018. This early signal is based off only 2 data points, though. Historically, land sales have been a strong predictor of future price growth (with a long lag) – as the most basic measure of supply. US political populism is taking aim at share buybacks via legislation aimed to outlaw the practice being proposed by Senators Schumer (D-NY) and Sanders (D-VT) unless corporations pay their workers at least $15 per hour. After years of prohibition, share buybacks were given the regulatory green light in the 1980s, and, subsequently, they blossomed as incentive-related compensation for executives surged under the guise of stock options due to tax legislative changes in 1993. The rise of passive investment managers as outside shareholders may have boosted the use of share buybacks by corporate insiders, because these investors are less likely to question governance issues, including distribution policy. Meanwhile, there is little evidence to support the claim that share buybacks have artificially boosted S&P500 operating EPS growth, while the bulk of the share count shrinkage since the Great Recession has been skewly-distributed amongst constituents. Gross fixed investment by US non-financial corporations is currently at a record-high, thereby diffusing the claims that share buybacks have been to the detriment of capital spending and, ultimately, workers. Regulation aimed at curbing share buybacks is unwarranted, but measures to curb corporate cronyism are probably needed to enhance overall governance standards. SPX is putting on the final touches of a maturing rising wedge with a similar pattern set up that we pinpointed in September 2018 that led to our short call at SPX 2,944. RSI divergence has not confirmed recent highs and formed a triangle mirroring the pattern set up in September 2018. RSI bear divergence warns that the rise is at risk given slowing upside momentum and buy volumes. Global risk appetite remains strong and could delay a break down with upside noise from a trade deal spike but this compelling set up warns of disappointment stemming from deal hurdles, lack of key trade point resolution or a drawn our trade schedule with underlying tariffs that leaves markets wanting after pricing in the better part of a full deal. Sell the fact set up? Breadth has deteriorated markedly from the early February peak as the SPX continues to chisel out new highs as internals weaken, again mirroring the late 2018 cycle. Polycab India (POLY IN) raised around US$190m in its IPO through a mix of selling primary and secondary shares. It is the largest manufacturer of wires and cables in India with a 12% market share, as per CRISIL research. The company also recently entered the consumer electrical segments. In this insight, I will re-visit some of the deal dynamics and provide a table with implied valuations.